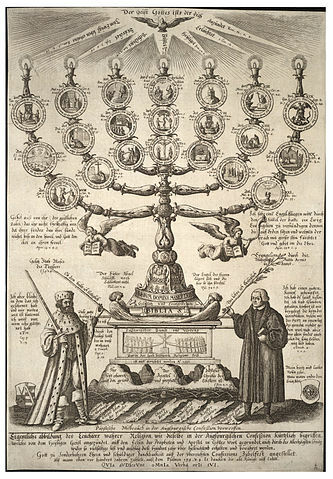 An illustration of the first 21 articles of the Augsburg Confession by Wenceslas Hollar. The Augsburg Confession is one of the confessional symbols that identify the Evangelical Lutheran Church. It is like the church’s “birth certificate” because it summarizes what Lutherans believe and teach. It shows that the Lutheran Church is an apostolic church, and faithfully and genuinely teaches God’s Word and administers the Sacraments in conformity with Christ’s institution. Twenty-five years after Columbus discovered America (1492), Martin Luther nailed the 95 Theses on the Castle Church door in Wittenberg, Germany. This act, which occurred on October 31, 1517, was the “kick-off” for the Reformation. In the following years other groups arose opposing the Pope (Reformed and radical groups), but Luther and his followers could not come to agreement with them on a number of important doctrinal aspects. You can read an older translation of the Augsburg Confession online here for free. For an up to date translation that’s easy to read, check out The Book of Concord – A Reader’s Edition from Concordia Publishing House.